Today, PCBs are an integral feature of advanced electronic applications. Although all these electronic applications may have differing requirements, still they all require performance-driven, and error-free PCBs. As known, PCBs are also an integral part of mission-critical applications in medical, defense, and military, where lives of people might be at stake. Hence, it becomes important to ensure that PCBs operated as expected. With the advancement in various PCB technologies, the designs are becoming complex. They feature several fragile components and solder connections. At times, it may become difficult to analyze the root cause of failure of components that have led to the catastrophe. Thus, PCB manufacturers are driven by the need of instituting various testing and inspection procedures during the PCB design and manufacturing. This post discusses various PCB defects, and PCB inspection and testing methods adopted by PCB manufacturers to rectify defects. With so many micro-sized components involved in a PCB assembly, visual inspection becomes difficult. This is where the criticality of inspection comes into the picture. The following are some common defects that are detected during the inspection. 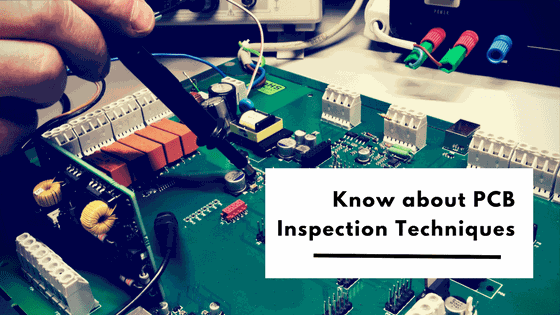 Visual Inspection: This is the most common type of inspection conducted on a PCB assembly. Equipment for visual inspection can be selected on the basis of inspection targets. For instance, reflow solder joints are inspected using a prism. Light rays reflected by the joints help experts to identify various manufacturing defects. X-ray Inspection (AXI): Surface Mount Technology (SMT) has emerged as a leading PCB technology, because it has contributed to the rising demand for miniature devices. Nowadays, PCB manufacturers are designing densely populated circuit boards, which may have more than 10,000 solder connections. SMT has initiated the demand for chip packages like (CSPs) and BGAs, where solder connections aren’t visible. This is where the prominence of AXI comes into picture. This method allows PCB manufacturers to inspect components, soldering, component misalignments, and more. X-rays are directed on the PCB components, which absorb them, and produce an image on the other side. X-ray inspection helps identify defects in wiring assemblies, semiconductor packaging, voids in solder joints, BGA solder defects, etc. Automated Optical Inspection (AOI): In this method, the circuit board is scanned using a single or multiple video cameras. The camera clicks images of the components at various angles. These images are analyzed by experts at PCB assembly services to identify defects like scratches, nodes, stains, and several other dimensional defects. The AOI systems can also detect skewed or incorrect components. Nowadays, various 3D AOI equipment are used in place of 2D systems for fault detection. These systems also allow manufacturers to detect the height of micro-components used on the PCB. AOI system can be deployed at various stages of PCB manufacturing. The above-mentioned are the popular PCB assembly inspection methods employed by the PCB manufacturers. What are the popular PCB testing methods employed by the PCB assembly and manufacturing services? Stay tuned to the next post to know more.